I’ve always liked this pho­to­graph, and the mem­o­ry of the day that I took it (which often con­founds a photographer’s abil­i­ty to tell if a photo’s any good or not). I’ve even writ­ten a post about this image before (which you can read here). Even so, I’ve nev­er print­ed it, so I fig­ured this Dai­ly Print project was just the excuse I need­ed. The pho­tographs from my two pre­vi­ous posts were both tak­en while I was doing owl sur­veys and wait­ing for the sun to set (with cam­era at the ready, of course). So I thought I’d post an image of what we were out there look­ing for. 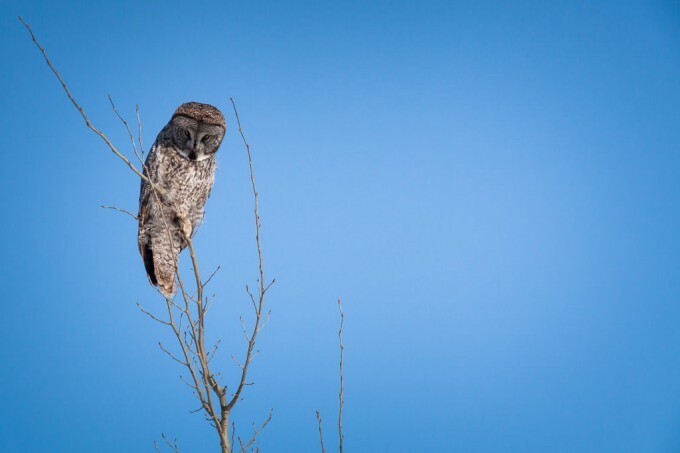 I don’t shoot a lot of wildlife, but I sim­ply could not resist fill­ing up a mem­o­ry card while watch­ing this owl hunt for rodents under the thick, spring snow. It was amaz­ing to watch him (or her, I’m not sure) lis­ten­ing from the tops of these small aspen trees before swoop­ing down and div­ing feet-first into the snow after his prey. I had the plea­sure of watch­ing from a dis­tance for over an hour before he final­ly gave up, or got full, and slow­ly moved off. I recent­ly received a request from a woman to use this pho­to­graph in a blog post she’s writ­ing, which gave me the great excuse to re-vis­it this image and to share it here (it hasn’t made it into the new web­site yet, but watch for it in the Birds sec­tion of my cat­a­logue, hope­ful­ly in the next few months). 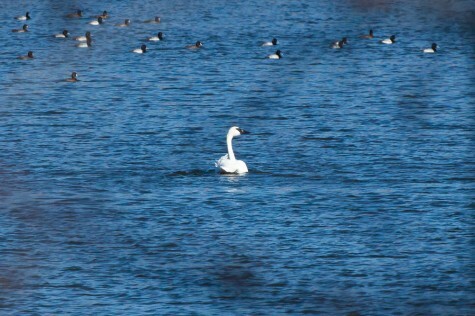 I took this pho­to near the Beaver­hill Bird Obser­va­to­ry near Tofield, AB in the spring of 2007. At the time, I was exper­i­ment­ing with defo­cus­ing images, or por­tions there­of, for cre­ative effect. In this case, the orig­i­nal image was most­ly sharp, and I “paint­ed in” the blurred effect in post-pro­cess­ing. 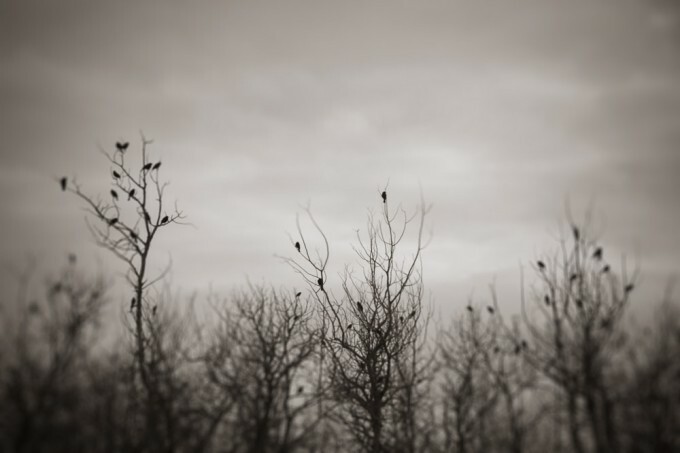 I was inspired to try this tech­nique by anoth­er pho­tog­ra­ph­er who would cre­ate the same effect in the dark­room by spilling chem­i­cals over the dry­ing print and using a brush or sponge to blur the image. It’s always fun to try new tech­niques, and although I haven’t tak­en many defo­cused pho­tographs late­ly, you can view a selec­tion of these images in my “Bore­al Impres­sions” port­fo­lio. I’d also rec­om­mend hav­ing a look at William Neill’s “Impres­sions of Light” port­fo­lio for more great blur­ry images that were an inspi­ra­tion to me (although he achieves the effect most­ly through long shut­ter speeds and cam­era move­ment, rather than man­u­al­ly defo­cus­ing the lens). It’s been a win­try cou­ple of days in the Edmon­ton area, but these bison don’t seem to mind it. 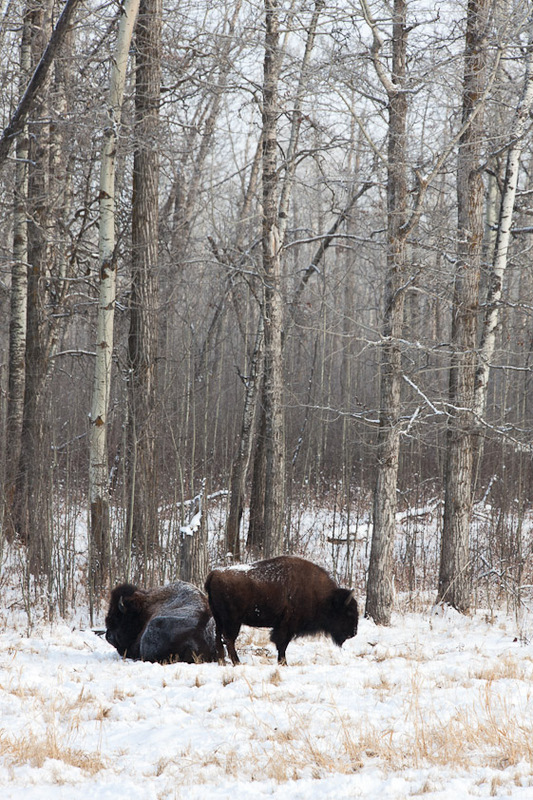 I took this pho­to­graph out at Elk Island Park recent­ly, and I love how the fresh snow is just lying on top of the large bison. I had the good for­tune of being able to watch a small herd slow­ly mov­ing along and graz­ing through the snow for about an hour before they moved fur­ther off into the trees. P.S. I hope you like the “new and improved” larg­er in-post images start­ing with this entry. As always, you can click an image to view it full-screen. Enjoy! 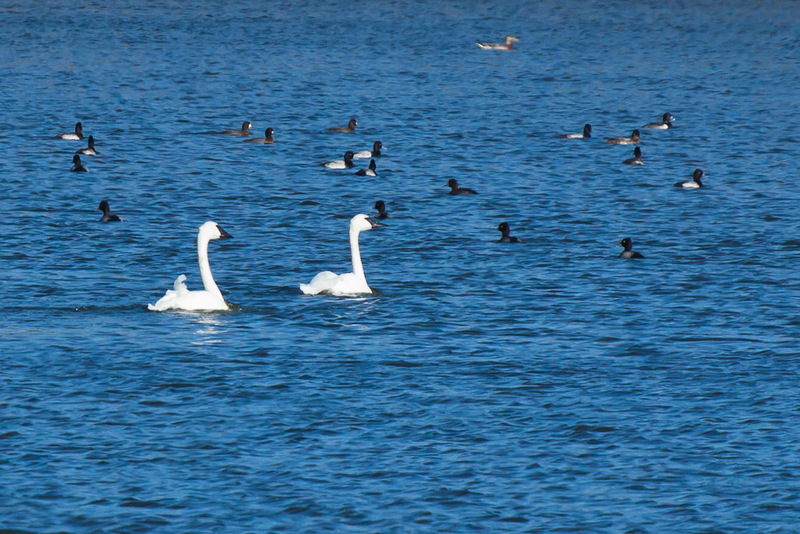 I was walk­ing the Waska­he­gan Trail though the Min­is­tik Lake Game Bird Sanc­tu­ary a cou­ple days ago (Oct 5th, to be pre­cise), and came across this pair of swans. 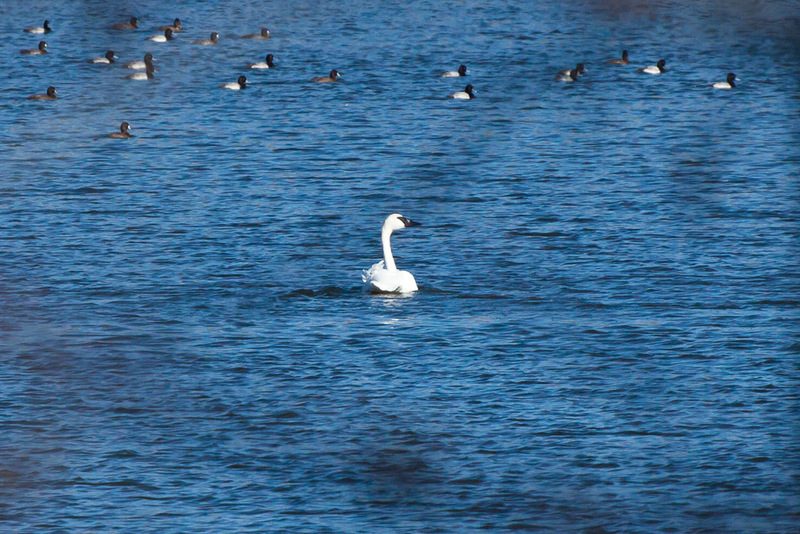 While it’s fair­ly com­mon to see migrat­ing Tun­dra Swans fly­ing (and honk­ing) over­head in flocks this time of year, I am pret­ty sure these are the much less com­mon Trum­peter Swan — but I would real­ly appre­ci­ate if some­one more famil­iar with Trum­peters could con­firm (or con­test) my ID. 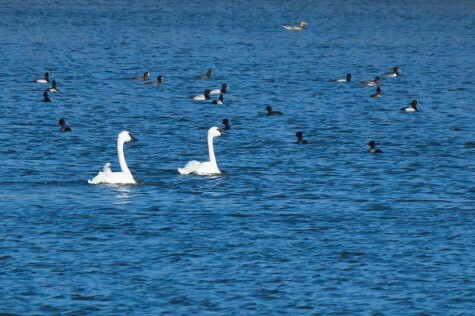 These two birds were on Bray Lake, right in the mid­dle of the sanc­tu­ary, and were there when I first passed the lake, and still there lat­er in the after­noon on my way back. This is what I love about Min­is­tik — there’s always some­thing new to see, you just have to get out there and look for it. I don’t nor­mal­ly pho­to­graph much wildlife (I don’t have the long lens­es and patience usu­al­ly required), but I couldn’t resist this lit­tle bird (a Yel­low-rumped (or Audubon’s) War­bler) that I watched feed­ing along a small moun­tain stream for near­ly a half hour. It was very ear­ly in the sea­son and there had been a lit­tle snow overnight so the air was cool and damp, and the insects this bird was after were mov­ing real­ly slow­ly. 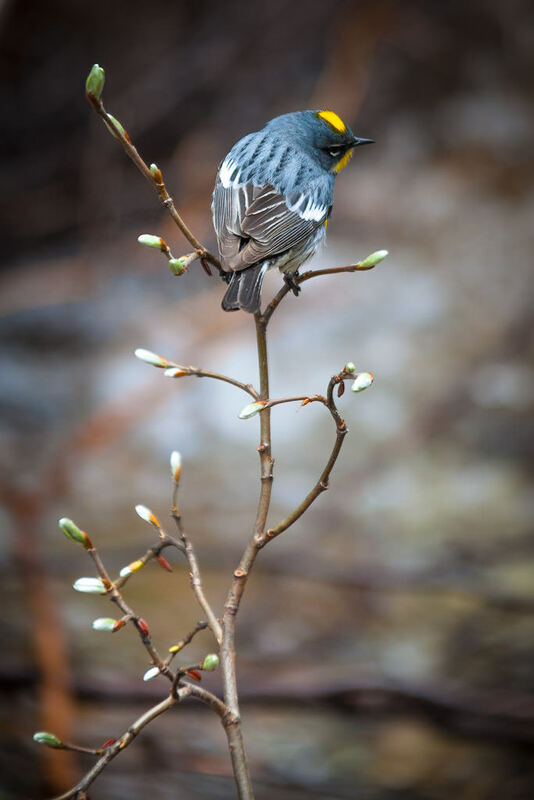 He would perch on these wil­low saplings over the creek, turn­ing his head to watch and then dart out to grab his meal from the air or the under­side of a new leaf. It was a lot of fun to watch, and — employ­ing the time hon­oured, fine-art, “shot­gun” approach to com­po­si­tion — I filled up a good por­tion of my mem­o­ry card try­ing to get just the right shot. I know this pho­to­graph breaks a cou­ple “gold­en rules” of com­po­si­tion — you’re not sup­posed to cen­tre your sub­ject (rule of thirds) or have the sub­ject look­ing out of (rather than into) the frame. But I think it works this way (I even cropped in a lit­tle from a more “tra­di­tion­al­ly” framed shot). I think the shad­owed area in the top-left bal­ances the light, emp­ty area at the bot­tom, and for me, the bird’s out-of-frame gaze gives a bit of the feel­ing that he’s just about to leave the frame him­self (which in fact he did). Let me know what you think — just click below to add your thoughts. Thanks!